Searching for a home within the East Lake Elementary School Zone? Then you are in the right place! We work hard to make your next home search easy and efficient, so that when you are ready to buy or sell, we are ready to help! 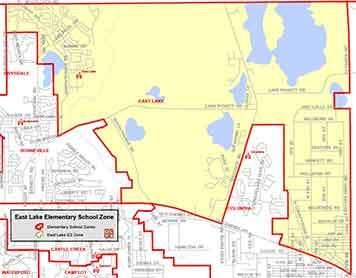 Students of East Lake Elementary reside within the 32820 and 32709 zip codes. East Lake Elementary opened its doors to students on August 8, 2005 with 799 students. Originally the Bonneville/Columbia Relief School, incoming students suggested and voted on the school name, mascot and colors. Currently East Lake is home to 657 students Awesome Eagles in grades K-5. In addition the A.M. Voluntary PreKindergarten Program hosts 19 students. 100% of the Instructional Staff is recognized as Highly Qualified, 74% are ESOL Endorsed, 25% hold advanced degrees and 10% have achieved National Board Certification. East Lake Elementary has been recognized by the Florida Department of Education as an "A" rated school since it opened in 2005-2006.